A healthy digestion is key to good health. It’s no secret that we’re big fans of the old adage, an apple a day keeps the doctor away. We talk about the health benefits of Ambrosia apples a lot in this blog. One of these health benefits is that apples aid digestion. Now, this might not seem like a big deal. Not a lot of us go around thinking about ways we can improve our digestion. But, how well we digest our food impacts how efficiently our body accesses the nutrients and energy in the food we eat. Without good digestion, our cells may not get all of the value they need in order for us to be in optimal health. Plus, when we have poor digestion, it can impact how we feel overall. It can cause weight gain, inflammation, abdominal pain, constipation, and fatigue. 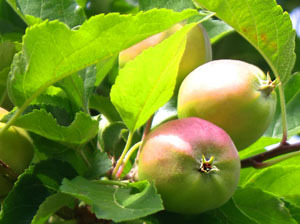 Apples are high in soluble fibre known as pectin. If you’ve ever made jam or jelly before, you know that pectin forms a bit of gel when it comes in contact with liquid. The same thing is happening in your stomach when you eat apples. The pectin attracts water, forms a gel which slows down the whole digestive process. It gives the body more time to extract nutrients from the food you’ve eaten before your body can get rid of it. Pectin has another benefit to digestion. It works as a collector in the gut. It binds to toxins and cholestrol and escorts them out of the body. Imagine a mall cop corralling some disruptive teens and showing them the door. Pectin is the mall cop of your digestion. Cellulose is an insoluble fibre found in apples. This is beneficial to digestion because it helps to form a healthier bowl movement. This, in turn, helps to move things through once your body has gotten the nutrients out of the food. And, it helps to relieve constipation and the pain that can sometimes come with it. Just be sure to eat the skins with your Ambrosia apple to get the full benefit. So, you can see, apples help digestion at each stage. And, that’s why the old adage about keeping the doctor away still rings true today. But, just because it’s an old adage doesn’t mean you can’t enjoy the best new variety of apple out there – Ambrosia. Your taste buds and your digestion will be grateful.